She’s all angles, tough and mean. A real Brute, so much so ever her maker calls her one: Brute 2.0. A motorcycle is almost always a she, even when bulging with muscles and hard, angular lines. 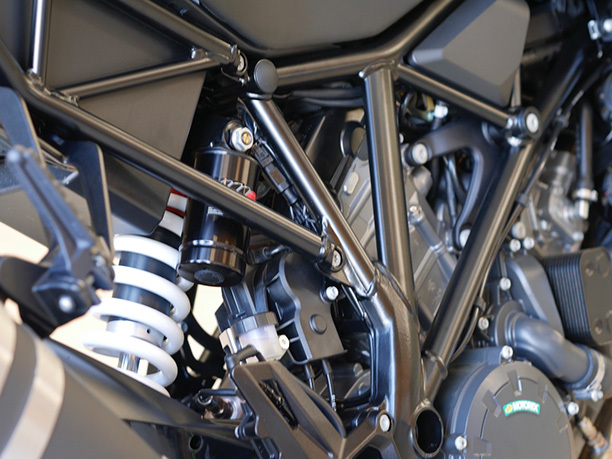 And the KTM 1290 Super Duke R has spent a bit of time in gym lately – the 2017 model’s 177 horsepower makes her one tough mother of the naked-performance pack. She’s a sculptured beauty, too. Naked in black with orange highlights or naked in white, black and orange, both graphics have their attractions… the white models has the signature KTM orange frame and wheels with a black tank to the relatively stealthy black model, whichever you choose you’ll stand out. 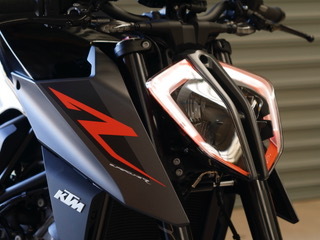 Have a good look at the punisher-style headlight – you’ll be seeing a lot of those in the future, as KTM’s said it’s a new signature style for the brand – LEDs which shine sideways into the reflectors and an alloy heat sink between the two halves of the headlight. From the saddle plenty of night-time illumination while telling others what’s coming. KTM is calling the technology which makes the 1290 Super Duke R easier to handle ‘Grin Amplifiers’, which is certainly hard to say with a straight face, but away from the marketing department it’s the electronics package which is doing a lot of the heavy lifting here. And it does put a smile on your dial. 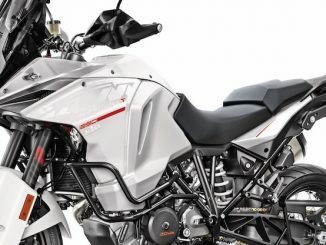 There are rider modes, cornering ABS, traction control, cruise control, ride-by-wire, proximity fob ignition… the list is long and comprehensive. Most of it is adjustable from switched off to quite intrusive and there’s a range of options to enhance the experience… that means make it faster. The engine’s boost in power from the older model – is up around 4hp, with an extra 500 rpm available before redline. It comes from a host of changes, none in particular major. There are shorter intake tracts, which KTM claim help boost the power but also flatten out the torque curve. I wasn’t impressed when I realised we’d be using the short, tight ‘Amaroo Park’ circuit at Sydney Motorsport Park – the chopped-off Southern-end of Australia’s second GP track features around 14 corners in a lap time of under one minute, which means there’s no time to relax, or get into top gear – in fact I only used second, third and fourth. But after a few laps I realised the Super Duke R is probably better suited to short, tight circuits – which is mostly what we’ve got here in Australia – than a longer track with a high-speed straight, because the lack of fairing and almost Supermoto riding position work best when you’re throwing the bike from side to side, not trying to tuck in down a long straight. That riding position – which is slightly changed from the 2016 model, although I had to be told that, I couldn’t tell from just jumping on – is also good for commuting or riding to the track, so as a ride day bike, winding road blaster and all-round fun machine, the 2017 KTM Super Duke R would be a nice lady to spend some time with. KTM desert Rider Ben Grabham has moved from 11th to ninth place overall after finishing sixth in Stage two of the Dakar Rally, taking place from San Luis to San Rafael, Argentina. On the cover of Cycle Torque’s August issue is our own TT racer Alex Pickett.